John Nash will present “Design Thinking Applied in Higher Education” on June 28, 2016 at the Penn State University Academic Leadership Academy. John Nash and Beth Rous conducted a symposium at the International Society for Early Intervention entitled “Disrupting Traditional Paradigms of Inclusion Through Design Thinking,” in which they reimagined the classroom and coaching experience by walking in the shoes of children and providers. Click here to view see their virtual handout from the session, including their slide deck and supplemental links. John Nash and Beth Rous conducted a symposium at the 2016 National Early Childhood Inclusion Institute, in Chapel Hill, North Carolina, entitled “Radical Collaboration: When Children and Providers Co-Create Programs,” discussing their participation in state-wide work to re-think how early childhood programs and professional coaching could look. Click here to view see their virtual handout from their session, including their slide deck and supplemental links. John Nash, director of the dLab, talks with Todd Hurst of Indiana University’s Center of Excellence in Leadership of Learning (CELL) on design thinking and the New Tech network. John Nash, dLab director, talks with a student at Decatur Central High School about their experience in a design thinking workshop with teachers and directors from New Tech schools across Indiana. Tom Wachnicki, New Tech Director at Decatur Central High School, in Indianapolis, IN, talks to John Nash about the ways design thinking fits with the New Tech approach. In collaboration with Dr. Laurie Henry, of the College & Career Readiness Lab, the dLab kicked off a new project to develop digital badges for design thinking. The overall project, a collaboration between Henry and dLab director Dr. John Nash, will culminate in an digital/technical infrastructure for delivering competency-based badges. Dr. Henry’s focus will be on granting badges for soft skills in business settings for adult learners. Nash’s efforts will center of developing a badging system for different competencies associated with design thinking. The debut of the project took place at the College of Education “Rocket Launch” luncheon, the second in an occasional series of lunch-hour colloquia focusing during which faculty and staff announce the launch of new products, projects and publications. 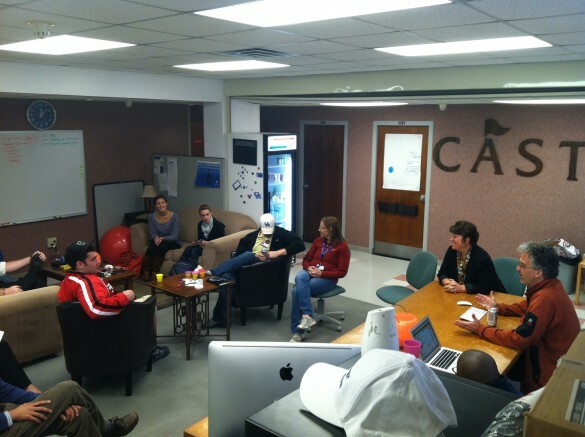 To inquire about the badging project contact the dLab here. The dLab is now curating videos on Vimeo! Check out the catalog here. Focusing on design thinking in education, the post includes eight videos on design thinking in schools from organizations such as Ideo, the Stanford d.School, and the Henry Ford Learning Institute. The video was plucked from work Nash did prior to arriving at the University of Kentucky, where he applied tenets of design thinking in his educational leadership courses at Iowa State University. 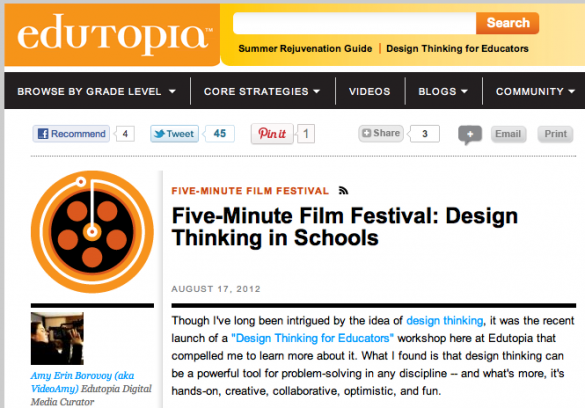 See the Borovoy’s 5 Minute Film Festival: Design Thinking in Schools here.